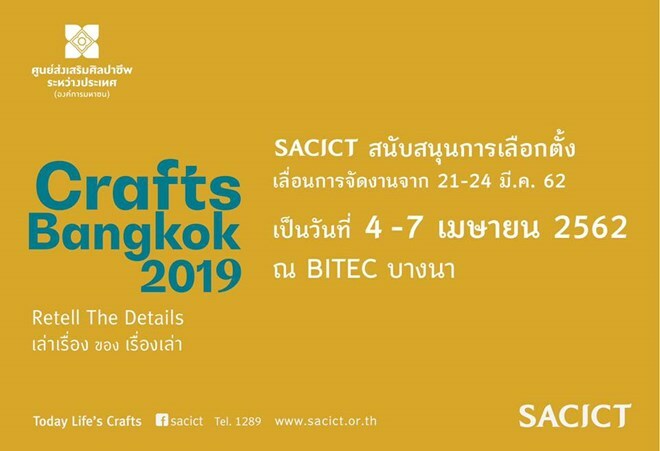 Bangkok (NNT/VNA) - Crafts Bangkok 2019 will be organised from April 4 - 7 at BITEC Bang Na in Bangkok, showcasing Thailand's finest handicrafts from containers to ornaments. The event will be divided into several zones featuring works from various craftsmen, disciples of famous artisans, several royal initiated projects, educational institutes, and the Foundation for the Promotion of Supplementary Occupations and Related Techniques (Support Foundation) of Her Majesty Queen Sirikit of the Ninth Reign. Event-goers can also expect to see hand-made products from 12 nations, while the craftsmen themselves can take part in marketing campaigns, and exchange ideas among fellow craftsmen. Director of the SUPPORT Arts and Crafts International Centre of Thailand Ampawan Pichalai explained that the event, the second of its kind, has a theme of telling tales through handicrafts and creativity. She is confident that the goods being offered this year would cater to the needs of the current generation while maintaining the Thai aesthetics.